Even though I have been in a church that teaches a pre-trib rapture since I got saved in 1978, I never could see what the teachers “saw” in Revelation 4:1. Then, in 2012 I had an open vision that propelled me into a deep Biblical study of the rapture. In the vision, I saw the earth hanging in its atmosphere with diamonds buried throughout, representing “true lovers of Jesus”. Then a fire broke out in northern Asia/Russia, which I knew was to happen in the not too distant future. It spread until it devoured the entire earth, burning up everything like stubble. All that was remained were the diamonds. The selfsame fire that destroyed everything in its path only made the diamonds shine brighter. Then I heard the voice of the Lord say, “I did not give my life to fill a roster full of names. I died to produce for myself a bride, one who genuinely loves me with all of her heart, soul, mind and strength, and who is loyal to Me. And she shall be mine on that day that I make up my jewels.” (Mal. 3:17). When the vision ended, I asked the Lord if He was showing me the great tribulation. He didn’t answer, so I began a deep study of every verse having to do with the rapture, from cover to cover . In the end, I could not find a pre-trib rapture in the Bible! However, I did find what Jesus taught about the rapture in Matt. 24, that it happens “immediately after the tribulation of those days.” I think Jesus, the final authority, should know. Why do so many Christians disregard what He said on the subject??? Then I thought further about the vision and the symbolism involved. “Tribulation” in the Greek, is “pressure”. 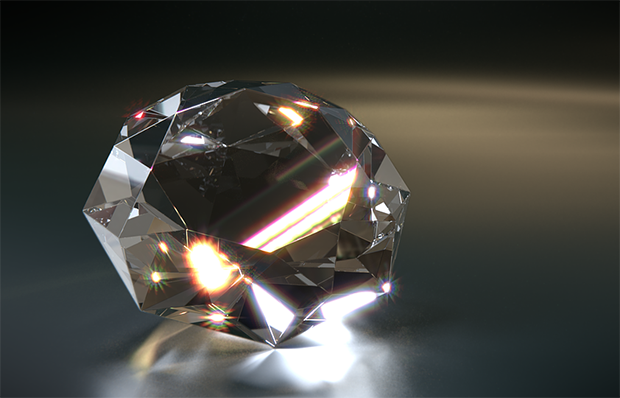 How are diamonds produced? They are formed in the midst of intense heat (ie. fire) and pressure. I believe my vision revealed the great tribulation, perhaps represented by World War 3 coming from China and Russia. It was revealed to me that the fire I saw devouring the earth was going to include, not only possible physical fire such as World War 3, but also a spiritual fire: strong persecution, even in America. (Luke 12:43-52). This persecution is going to widely separate the sheep from the goats, the wheat from the tares. The wicked will increase in wickedness, and the righteous will be purified. (Daniel12:10). There will be absolutely no option left for lukewarmness. Every Christian will be forced to choose between following Christ all the way, even to the point of imprisonment or death, or go all the way to the left. No one will be able to be an “undercover Christian”. It will be clearly revealed “who’s who”. Some will turn out to be traitors of other Christians, and this will be shocking. We must guard against being offended, and letting our love grow cold. We must learn now to love our enemies, and forgive everyone who has hurt us, before it gets bad. For those who are purified by the refining fire, it will result in true revival, such as Jesus described in John 17. We will see His glory, and many, many, many will be saved. This will be like the book of Acts, but far more intense. It will be the grand finale just before Jesus returns! “A time is coming to America that is going to be so hard, you are going to have to literally cling to Me to make it. You will have to know how to pray, to have a deep, personal knowledge of My Word, know My Voice, and know how to keep in step with My Spirit. Keeping in step with My Spirit could be the difference between life and death. Learn these things now, before it arrives, for then it will be too late to learn. I met with the Lord and He told me to buy FAZ again. I see the light of the remnant shining like the sun. EXCELLENT post of Truth. Thank you very much for sharing this. Kerry: As I read your prophetic word a picture came to mind. A picture of a dozen men in Libya kneeling on the beach, Christians, with isis men behind them holding knives to cut their throats. I saw no real fear in their eyes. When our time comes, I pray that we will stand strong for our Lord and Savior as they did. Absolutely correct. The church is here for the tribulation, but not when God pours out His wrath on a willfully unbelieving world. tribulation and wrath are two completely different things. tribulation is from Saten and the Antichrist, wrath comes from God down onto this earth. Hi Brenda, many people are confused because they consider the tribulation and the wrath of God as one and the same, or at least overlapping. The tribulation, and the great tribulation, which is the persecution of believers happens before the rapture and before the wrath of God. Then immediately after the tribulation (great tribulation in Mt 24) is the rapture. Then after the rapture is the trumpet portion of the wrath of God (over 1/3 of the earth), and finally the full 7 bowls of wrath poured out on the beast kingdom. So the wrath does not start until after the rapture. Birth pangs start the whole thing for everyone. Tribulation is satans wrath against the saints, Gods wrath is for the world after his bride is removed. This is how I’ve come to understand it after many years of study. Hi Kirk. I totally agree that the Church will go through some tribulation but not the wrath. There was a man named Percy Collet, who back in the 1980’s, had shared his experience of being taken to Heaven for 6 1/2 days. He asked Jesus point blank if the rapture would occur before the tribulation, mid-trib, or after, and Jesus told him that it would not occur before the tribulation, but before the wrath. Check out ‘Dream of Miami being bombed’ online, in which a lady expressly reveals a very real dream where she was shown that Miami and certain other cities in the U.S., are bombed just prior to the rapture – about 1 week or less. Jesus clearly tells her the rapture would not be more than a week after this occurs. Also, if you get the book ‘A Diary of Signs and Wonders’ by Marie Woodworth Etter, and look under a subtitle of ‘A visit from 2 Angels’, you’ll find an explanation of what a man was told when he was visited by 2 Angels years ago, part of which was that God would preach to the U. S. through the ‘mouth of a canon’, and then Jesus would come to take away His Bride. These things confirm one another and seem very clear to me. Brenda, thank you for sharing this. God bless you. Consider that a week doesn’t always mean a week of days. It could mean a week of years. Though overall I very much appreciate and agree with your take on the tribulation and the Wrath and when believers will be taken out of the way. I have come to wonder if the “taken out of the way” requires going to heaven or simply being moved by God to a safe place and under His Divine protection. Hi Jerome. Recall that Paul, after he spoke of us meeting Jesus in the air, said, “…and so shall we ever be with the Lord.” There’s no point in just moving us out of the way when He could take us to Himself – considering this is His Bride, I would think He wants her with Him, not just removed from the vicinity of wrath. Always the chilling Truth in your posts/comments Brenda. I guess the diamonds then would be those who will reflect only Jesus’ Light. Once again I have to laugh Cobus. If the truth is chilling – I guess that’s true. Yes, the diamonds are those who have truly changed into His likeness – like a diamond goes from black coal to crystal clear and sparkling. Hi Michele. Although I have stated scripture that plainly says we are not appointed to wrath, we can see whatever God wants us to see from Heaven or in the Spirit – wrath included. This might be the case for some of us, but certainly God is not going to have all of us ‘view’ or watch His wrath being poured out on everyone who is due it. What’s the point in that? As I said, some may benefit from it just as some benefit by a visit to Hell, but not all, and the same goes for the time of wrath. Once we leave this world, our point of interest is not what He’s doing on earth, but what’s going on in Heaven, for the time of the marriage supper of the Lamb will be arriving soon. Hi Michele. As much as I understand that many things in scripture can be symbolic – and I do understand and see much this way, not everything God has written is symbolism. Most of the time there is a good reason why God writes something in symbolic language, but when it comes to knowing what the martyrs are saying concerning their waiting for white robes, there’s just no reason to symbolize their message. ‘Avenge’, ‘ekdiceo’, does include ‘vindicate’ as a meaning, but along with ‘retaliate, punish and avenge’ and comes from the root word ‘ekdikos’, meaning ‘carrying justice out, punisher’, so I believe the passage means exactly what it says. They had been wrongly killed, and were wanting God to carry out justice on those who persecuted them. That’s why they don’t just ask for God to avenge them, but JUDGE those who did this to them. I totally agree that the book of Revelation is not clearly understood in this day. It’s not about Jesus per se, but Jesus being revealed in those who have become worthy of His appearing – as recorded in II Thessalonians 1: 10 & 11. Take note in Revelation 1:12-13, in which John says that he turned to see who was speaking with Him and saw one LIKE unto the Son of Man, and that in verse 15, His voice had the sound of MANY waters. Both suggest a corporate Body of people who together, look exactly like Jesus – just as Paul said should be the case in Ephesians 3: 13-14. It will be the worthy who have become so prepared in their spirits, that they can truly represent Jesus, whom Jesus will reveal Himself through in this day. Many will be anointed, but a limited number will have this honour. I do not agree the the First Resurrection (Rev 20:5) is a time period. The context and grammar clearly indicate an event with no indication of being over time. You state: “it behooves us to be listening to what God has to say to us today, not just in scripture”. Indeed – BUT – God does not contradict Scripture. Paul clearly states the Rapture/Resurrection takes place after the man of sin is revealed . (2 Thessalonians 2). Not till v 30 does he mention His return. Hi again Maj. I did not say, nor did I imply, that I was taking what God was saying now, as overriding scripture. Of course what He says now will not contradict scripture – that’s a given, but it can give us a clearer insight into scripture and that’s what I’m saying. I also stated that I heard you regarding the Anti Christ being revealed before the rapture – no question about it, but that does not mean we are in great tribulation. God has told me what causes the great falling away and it isn’t tribulation or persecution, and He has also made it very clear that there will be a group who receive His glory prior to that falling away, so there are events that occur that may not be specifically mentioned in chronological order in scripture, that will occur in our midst before major tribulation comes. Hi Maj, I take the first resurrection to be the resurrection of the just. Jesus was the first one resurrected and that was 2000 years ago. The dead in Christ will be resurrected at the rapture and any martyrs after the rapture will be resurrected at the end. In other words – ‘this is (completes) the first resurrection’ (of the just). The second resurrection is of the unjust. A famous Canadian Greek scholar (in his 80s at the time read this passage in the Greek. He was amazed he never saw this prior- the First resurrection included tribulation saints. I know some will say we are not subject to wrath – and that is true – but cannot God protect His own from the wrath even while here? I think so! For the Rev 20:1-5 verses- I see the first resurrection as the main one (big one including all dead in Christ) as the Greek for “first” is “prótos”: definition: first, before, principal, most important. If this is the “most important” along with the “first” meaning I see this as including the most Christians as in the Bride of Christ being raised which would indeed make it “most important”. So, the resurrection of the bride of Christ (rapture – as it includes those living being “caught up”) is indeed the “most important or absolute first”. For such a big deal I think it would be mentioned – and this seems like the most logical explanation due to the original usages in the Greek. Towards the end of AA Allen’s vision about destruction on earth, there was a distant sound of singing. He knew it to be coming from the saints who were kept in the cleft of the rock in the mountain of God. It was a joyfull happy bunch who did the singing and by the sound of it more likely as a result of the Feast of the Marriage of the Lamb than just being spared and protected on earth. After all, it was on the Mountain of God. I sugest you study the Bride/Bridegroom for more info on rapture. themightyhandofgod.com has a series on this in right side bar. HI Megan, If you put “rapture” in the search box, James has many studies of the topic covering all the verses. Blessings!! Thanks Kerry! In your vision fire breaks out in northern Asia/Russia and it quickly spreads world-wide, causing global tribulation and persecution. Rev. 13:2 confirms that: It says that the beast is like a leopard, signifying it comes on the world scene quickly. What carries it? The feet of a bear, Russia. So, when we see Russia become engaged in war the Lord is forewarning us that the formation of the beast will materialize quickly, like a leopard. Russia will be the catalyst for the revival of the beast power, causing its mortal wound (from the Protestant Reformation) to be healed. According to David Wilkerson’s prophecy, the beast is the apostate “Super Church” which is another pointed warning that organized Christianity will again exercise the persecutions of the dark ages. Powerful and enlightening. Thanks for sharing that Mark! Amen! It was actually a vision that was accompanied with a download that lasted for 6 hours. I had been seeking God to open my eyes to see “His glorious inheritance in the saints.” There was way more info that was downloaded, but like you, I believe He is getting His Bride ready! Thats soooo amazing you got the same thing!!!!!!! Thanks so much for sharing sister! By the way, i wrote a whole chapter on this vision in my book, Against All Hope Until. If you like, send me your personal email at unveilinghope@gmail.com, and ill email you a pdf of the chapter! We share a lot in common!